Just like an annual physical exam helps you assess your personal health, an ALESYS Training Effectiveness Evaluation determines the health of your Learning/Training programs, processes, and functions. Our Training Effectiveness Evaluation process generates much more than just a report to Senior Management. It thoroughly assesses what you are doing well to help you achieve your vision and business goals. And it carefully documents what is not working to support your goals. It then goes one step further and gives you specific recommendations for how to improve what’s not working well, as well as how to maintain and even improve what is working! Our Training Effectiveness Evaluations contain very powerful information that enables you to move confidently and swiftly in the right direction. Our Workplace Improvement Team starts by understanding your current situation. We talk with many of your staff and Customers, observe people doing their jobs, examine training procedures, and study the data you have about your Organization's performance. Next we look for causes of any problems uncovered. We search deeply until we find the real issues and the true source of difficulties. Then we submit recommendations on how you can get things moving in the right direction. The solutions we recommend always focus on the most cost-effective ways to achieve your vision and business goals. We bring best practices to you, as appropriate. We’ll include specific recommendations for improving the skills of your Training Team, as well as your Supervisors and Management Team if appropriate. The deliverable from our Effectiveness Evaluation will not be just another report, but an in-depth analysis that tells you what your organization is doing right and what you need to improve. 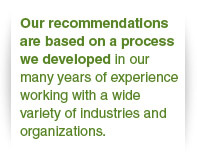 Our recommendations draw on our many years of experience and incorporate best practices that will solve your problems. After you have had time to study our report, we’ll schedule a strategy session where we can pursue next steps for achieving your goals. Like to learn more about how our Training Effectiveness Evaluation can improve the performance and results of your organization?